Dhaka, Aug 6 (Just News): Situation in and around Bashundhara Residential Area has turned violent with at least 40 people, mostly students, being injured in clashes as police started throwing tear gas shells and firing rubber bullets targeting students who gathered there protesting attack on their peers. The clashes briefly came to a halt around 4:10pm as policemen took positions at different points in the area after dispersing the agitating students, reports our correspondent from the spot. After around 10 minutes, police again began throwing tear gas shells and firing rubber bullets at the students. Tense situation was prevailing in the area when this report was updated at 4:30pm. At least 40 injured people, mostly students, were rushed to Apollo Hospital, according to a doctor at the hospital's emergency department. Some passers-by and street children were also among the injured. It all began after miscreants today swooped on students of North South University (NSU) with sticks and bamboo canes when they were gathering at the back side of the university premises. The students gathered there to protest against the attack on East West University (EWU) students, said a faculty member of NSU. “Around 2:00pm, the students started gathering at the back of the NSU premises after they came to know the incident at EWU,” the faculty member said. Around 30 minutes later, a gang of youths wielding sticks and bamboo canes swooped on the students, the faculty also said. Several students were seen bleeding and rushing back inside the campus after being injured in the clashes. In the meantime, sounds of shouts and noises were heard coming from the direction where the students gathered. After a while, police started throwing over a hundred tear gas shells around 3:30pm targeting the thousands of protesting students from North South University (NSU), Independent University of Bangladesh (IUB) and other nearby universities who gathered in the area. 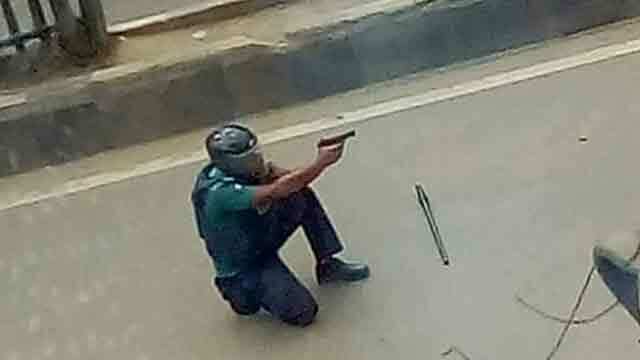 Armoured cars were stationed in front of the Bashundhara R/A gate and nobody could enter the area. An armoured car was also seen entering inside the area around 3:40pm, reports our correspondent from the spot. Police were lobbing tear gas shells indiscriminately towards the students who dispersed into various lanes and alleys in the area. Students too were throwing brick chips towards police and chanting “Bhua...Bhua (fake…fake)” whenever they could get a chance. Students were also seen blocking the roads inside Bashundhara R/A by torching tires and taking position with sticks in hand.